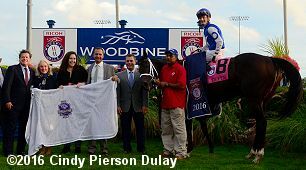 Owner Robert Masterson leads Tepin to the winner's circle after the Woodbine Mile. 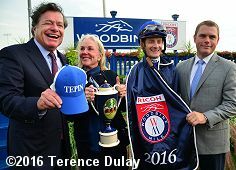 The $1 million Ricoh Woodbine Mile (G1) celebrated its 20th renewal on Saturday afternoon. Run at 1 mile around one turn of the E.P. Taylor Turf Course, it features some of the best turf milers in North America and Europe looking for an automatic entry into the Breeders' Cup Mile under the Win and You're In promotion. Conditions were less than ideal as rain fell through most of the card with temperatures in the low 70's, downgrading the course to "good", however the rain stopped just in time for the feature. 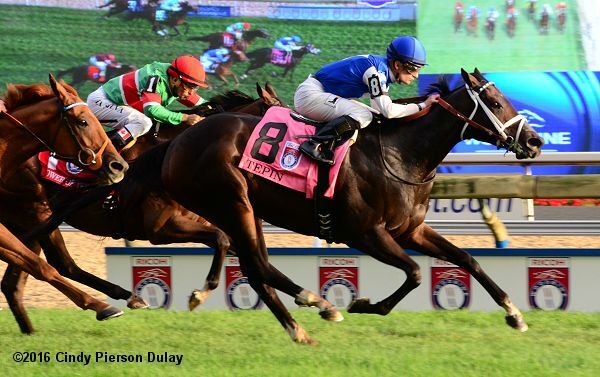 As expected, Tepin was sent off as the 2-5 favorite in the field of 8, winner of 7 straight including the Breeders' Cup Mile (G1) at Keeneland, Distaff Turf Mile (G2) at Churchill Downs, and the Queen Anne (G1) at Royal Ascot. Due to her heavy favoritism show wagering was not offered. 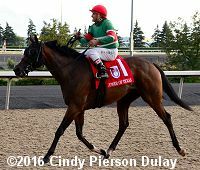 In to challenge her included 7-2 second choice Mutakayyef, third in the Juddmonte International (G1) at York after winning the Summer Mile (G2) at Ascot, and 8-1 third choice Full Mast, third in the Lure at Saratoga after finishing 4th in the King Edward (G2) at Woodbine. Tepin hit the gate and stumbled at the start but was quickly brought into stride by Julien Leparoux as 26-1 Glenville Gardens gained the lead down the backstretch through fractions of 23.38, 46.41, and 1:10.45 while pressed by Full Mast and stalked by 19-1 Arod, with Tepin looming large to their outside in fourth. Entering the stretch, Tepin came out for room and gained the lead at the 3/16 marker, opening up a length advantage on the tiring Full Mast through 7f in 1:22.01. Kept to task by Leparoux, Tepin held off late-running 24-1 Tower of Texas by 1/2 a length for the win in 1:34.13. It was a neck back to Mutakayyef third. 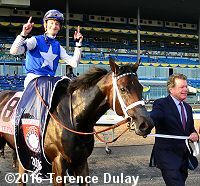 Left: Tepin in the winner's circle. 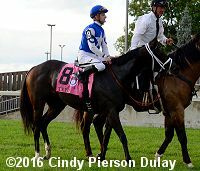 Winning owner Robert Masterson said, "She's done everything in the United States and we'd like everyone to be her fan. She has a great disposition. We might run her before the Breeders' Cup because she likes to run and she's better off running her than working her. 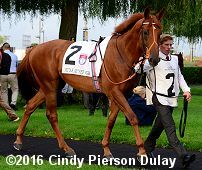 It's a long time before the Breeders' Cup, she's won three Grade 1's at Keeneland so we may run her at Keeneland in a Grade 1." Right: Tepin gets a drink from the hose from assistant trainer Kathryn Sullivan. Winning jockey Julien Leparoux said, "She's amazing. She got a little tired today, she's been off for three months but I think she's just going to get better after this race. I knew that they were not going to just give me the race, we had a good post, I could do whatever I wanted. We waited and made a final kick in the end. She makes my job easy, it was a good race, she got a little tired. From this race she'll get better. I'm not really sure what the plan is yet, obviously Breeders’ Cup, hopefully she'll keep on going the same way." Left: Owner Robert Masterson, his wife Joan, jockey Julien Leparoux, and assistant trainer Norm Casse pose with the trophy and winner's blanket. Leparoux added, "No, that was the first time (hearing fans chanting Tepin's name). When you talk about Tepin she has a real big fan club. Everybody loves her and it’s great. It’s good for racing, she’s good for racing and the connections are good for racing." Right: Tepin returns after the race. Norm Casse, assistant to his father trainer Mark Casse, said, "It looked like she may have needed this one. She's sitting on a big one next time, so I think we're ready, we'll go the Breeder's Cup and I feel really comfortable with what I got." Mark was unable to attend as his plane could not leave Kentucky due to the weather. 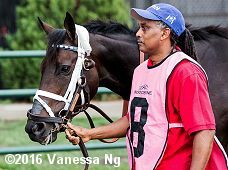 Left: Tepin in the paddock before the race. Right: Tepin in the post parade. 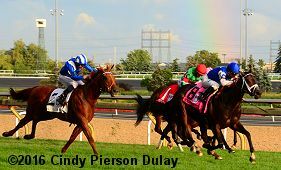 Casse added, "Julien rode a really smart race. He knew what we were up against, he knew we were coming off a layoff and he had to save a little bit. He wasn’t going to be able to make that big move that she typically makes. At no point did I ever think he’d be had today." Left: Second place finisher Tower of Texas returns after the race. Jockey Eurico Rosa da Silva said, "The horse ran very good. It's too bad I didn't have room a little bit earlier. I'm very proud of my horse. I've never seen my horse try so hard like he did today. Oh yes (gaining ground on Tepin late). If I had a little bit cleaner trip, maybe it would be different. Unfortunately, when I turned home I had nowhere to go, but when I had room he kicked so strong but the filly already had a couple lengths on me. It's really hard to make up ground on a good horse. I'm happy for the filly. She's a great horse." 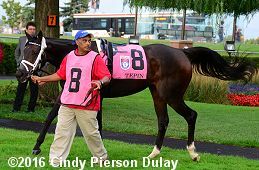 Right: Third place finisher Mutakayyef in the paddock before the race. Jockey Dane O'Neill said, "We could have done with a stronger pace, but we'd never have beaten the filly. She's exceptional and she's right back on song to do what she did today. If one or two things had gone in our favour, I think we definitely could have been second. The ground was maybe a bit loose but I think the pace was more a detriment than the ground. 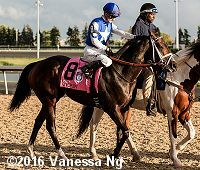 (Tepin) had the race won. We weren't gaining. She'd done enough and she knew that."